Today, data security is non-negotiable. It’s a critical component of any corporation’s day-to-day operations, including the legal process. KirkpatrickPrice announced today that E-STET, a California-based legal technology provider, has received their annual SOC 2 Type II attestation report. The completion of this engagement provides evidence that E-STET has a strong commitment to deliver high quality services to its clients by demonstrating they have the necessary internal controls and processes in place. SOC 2 engagements are based on the American Institute of CPA’s (AICPA’s) Trust Services Principles. 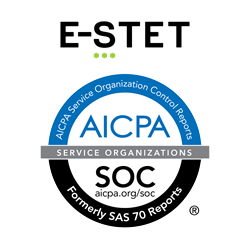 SOC 2 service auditor reports focus on a service organization’s non-financial reporting controls as they relate to the principles of security, availability, processing integrity, confidentiality, and privacy of an organization. KirkpatrickPrice’s service auditor report verifies the suitability of the design and operating effectiveness of E-STET’s controls to meet the criteria for these principles. E-STET is a California-based legal technology company making the practice of law more efficient through technology and innovative business solutions for corporations and AmLaw 100 law firms. Founded in 2007, E-STET’s cutting-edge team of lawyers and computer engineers enjoys pushing the legal tech envelope for its law firm and corporate clients with next-generation technology and service offerings. E-STET has been on Inc. Magazine’s 5000 fastest growing companies in America list for four years in a row, and on Deloitte’s Fast 500 list of fastest growing technology companies in North America. Email E-STET at contact(at)e-stet(dot)com or visit http://www.e-stet.com for more information. KirkpatrickPrice is a licensed CPA firm providing assurance services to over 400 clients in more than 46 states, Canada, Asia, and Europe. The firm has over 10 years of experience in information security and compliance assurance by performing assessments, audits, and tests that strengthen information security and internal controls. KirkpatrickPrice most commonly provides advice on SSAE 16, SOC 2, HIPAA, PCI DSS, ISO 27001, FISMA, and CFPB frameworks. http://www.kirkpatrickprice.com.